“Doll Bones” by Holly Black | Mel Reads YA! The book you recommended to me was a book that seemed really cool for someone who likes creepy books. 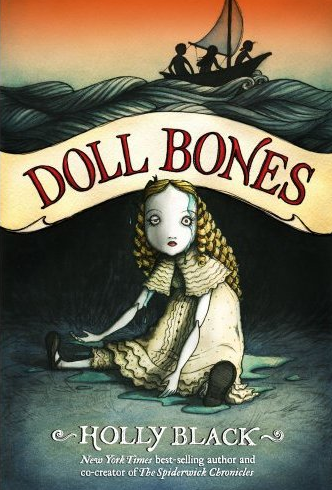 Holly Black’s Doll Bones is about three 12 year olds who play a never ending story-type game. The dolls are Lady Jayne, William, the mermaids, and the queen. The kids are Zach, Poppy, and Alice. The dolls are all free except the queen. The queen is a china doll. Bone china, in fact. She is worth a lot of money, so Poppy’s mother keeps her locked in a glass cabinet. The main goal of the game is to find a way to unlock and free the queen. One night, the queen goes to Poppy in a dream. She tells Poppy that she is real. She died when she was a little girl. She tells Poppy that when she died, her father could not take the thought of his daughter in the ground. So, he took her body to the doll factory where he worked and cremated her. He turned her into a doll, with her bones as the doll’s and her hair as the doll’s, too. The queen told Poppy that she needed to be buried in the cemetery where her casket was, just under a willow tree in Ohio. Poppy takes the doll and shows Zach and Alice. In the doll are the girl’s ashes. They set off on the trip, but the queen is still haunting Poppy’s dreams. I would tell you what happened next, but I got too creeped out, so I put it down. It’s not every day that I put a book down. Anyway, thank you for recommending this book to me.